With what has always felt like the perfect mix of fairy tale elements - the classic hero, the fearsome villain, and a beautiful heroine - it’s no wonder that Sleeping Beauty is one of the most beloved Disney animated films of all time. To celebrate its 55th anniversary Disney has made this a banner year of celebration for the movie. Earlier in the year with the movie Maleficent, and now with a Blu-Ray re-release of the original classic as the Sleeping Beauty Diamond Edition. Deleted Scene: The Curse is Fulfilled - This is a storyboarded scene that would have occurred just after Aurora is returned to the castle. She hears a voice calling to her, when she comes upon an old woman with a spinning wheel that she refers to as a “wishing wheel”. The old lady convinces Aurora to touch it, and she falls to sleep upon doing so. Alternate Scene: The Arrival of Maleficent - Maleficent arrives at the party as “Miss Maleficent Fairy of Darkness”. It’s a somewhat different version of the scene. Deleted Scene: The Fair - Here was get what is almost an entirely different plotline. We learn that the fairies cast a spell of protection on the castle, and King Stephan keeps her locked in the castle. The Princess swaps places with a servant to go to the Fair. Maleficent’s vulture, who can talk, disguises himself as a bluebird to get some intel about Aurora. Maleficent meets with Aurora at the fair disguised as a gypsy and gives her a prediction about the future and meeting a tall dark man. And the vulture finds such a man, and he is introduced to Aurora, and they meet and fall in love. The Sound of Beauty: Restoring a Classic is a discussion about how the creation of the original 2-channel stereo music for the movie and how it was restored for the Blu-ray release. Original musical recording sessions were found in the archives, including alternate takes and versions. We learn how they had to take the magnetic recordings of the audio tracks and clean up the hisses and pops in order to be able to cleanly remix them with the music. Including some discoveries that had been hidden and obscured due to compression and re-recordings and multiple releases. In Picture Perfect: The Making of Sleeping Beauty we take a look at the progression of Disney movies from Snow White, to Cinderella, to Sleeping Beauty. How it moved away from certain story elements like sub-plots, and instead focus on the story elements. How despite being released in 1959, the story was set in 1952. Walt’s desire to cater to new expectations of the post-war culture of the 50s. How he didn’t want the artwork in the film to be watered down, and he turned the reins of art direction over to Eyvind Earle. Creation, origins and designs of the characters and the challenges of Maleficent’s interactions which are often her speaking to herself and the addition of Diablo to offset that. As well as discussion of many more aspect of the film’s creation and design. For fans of the Disney Legend there is Eyvind Earle: A Man and his Art. This is a look at Eyvind Earle, his life, and his artwork and how he came to work at Disney. And then his climb through his career as he came to work on Sleeping Beauty which is considered his magnum opus. Earle’s artwork can be found in Sleeping Beauty as well as Peter Pan and Lady and the Tramp. Continuing this series of shorts that has appeared on other Diamond Edition Blu-rays is @DisneyAnimation: Artists in Motion. Here Brittany Lee (Frozen, Wreck-It Ralph, Paperman), whom we’ve seen in prior shorts, talks about how she works with paper to help bring to life the designs of herself and others. As she talks about her chosen medium we watch her build a paper sculpture of Maleficent. Perhaps the most curious of extras on the Blu-ray is Once Upon a Parade which is the legend of the Festival of Fantasy parade as told by actress Sarah Hyland. There is also The Art of Evil: Generations of Disney Villains which talks about how the creation and evolution of villains in Disney animated features. Finally we have Beauty-Oke: “Once Upon a Dream” which continues the theme of including Disney karaoke songs on Blu-ray releases. 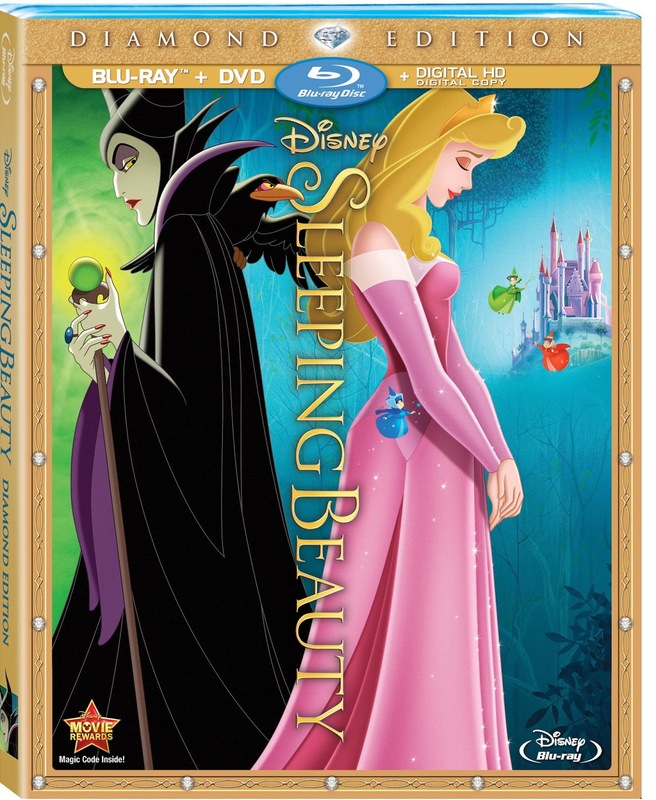 This second Blu-ray release of Sleeping Beauty is very well packaged. If you are not a prior owner of the movie and are looking to complete your collection it is an excellent choice. Having been previously restored, the movie itself is not changed from the prior release. The combo pack is the best choice if you’re also looking to own a digital copy of the movie to watch on your tablet or smartphone. Overall this is a well packaged and presented release.